Welcome everyone to the Elder Scrolls Legend Guide! This guide is designed to help you get better at Elder Scrolls Legends, learn its mechanics, and generally further yourself in the game. 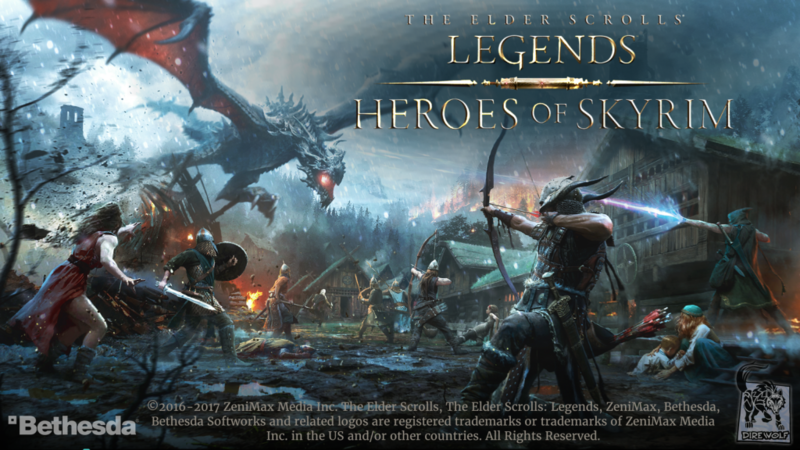 Elder Scrolls Legends is a TCG (Trading Card Game) Based off of the popular series The Elder Scrolls. There have been several Elder Scrolls games over the years and ESL pulls a lot of lore from all games and mixes it into Legends. 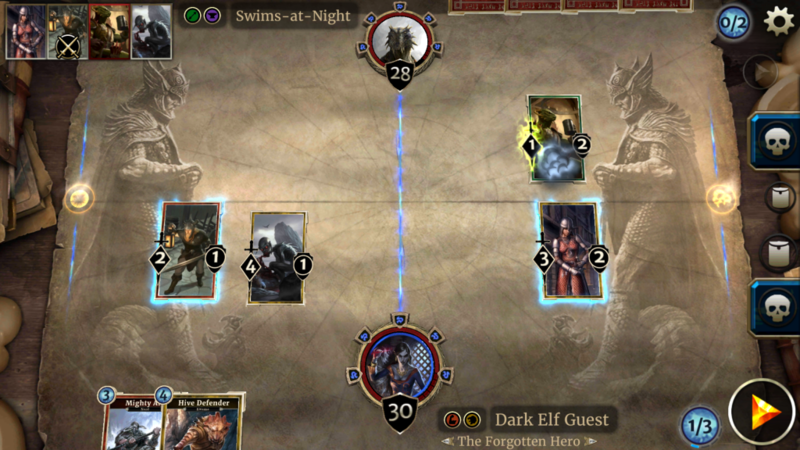 In Elder Scrolls Legends you follow through a well-written story much like in any Elder Scrolls game. Through the story, you choose your character avatar from a wide selection based on character races. After picking your avatar and race you’re given a deck of cards fitting to that avatar’s race and then your set off through the story mode. 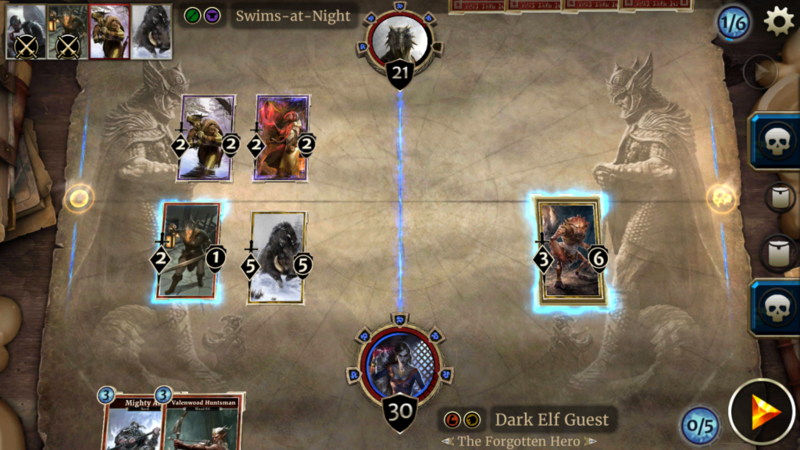 The story of Elder Scrolls Legends is unique and interesting for what you’d expect to see in a card game. The story takes place over different Acts, and in each act, there are a specific amount of rounds you have to go through before completing it. The first Act, for example, has 9 story points you go through and each one is its own card match. The story mode is extremely fun and has some neat little traits to it that make it interesting. One of these is the mechanic of giving a choice to the characters in some situations. In some story points your character is given an option to make a choice and depending on what you choose will give you a new card based off of that choice. So by having two cards at stake it really brings a new thought process to make the choice because you wanna pick the one that works with what card you want for your deck. 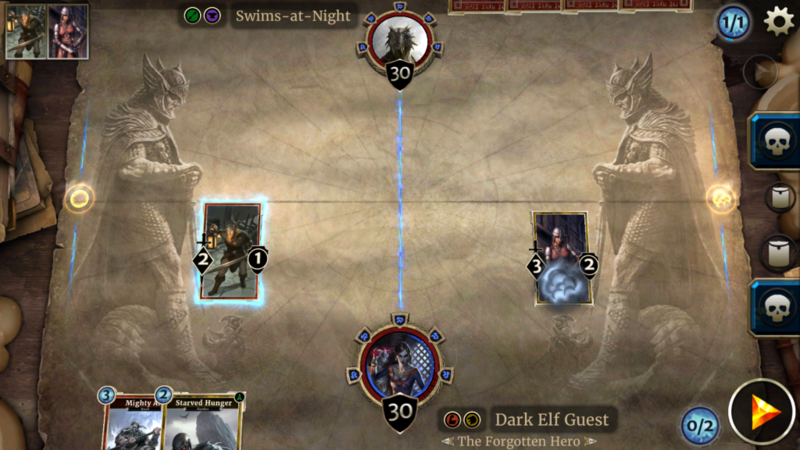 Elder Scrolls is known for its incredible and in depth stories and Elder Scrolls Legends is no exception. Next, we’ll talk about the card game itself and the mechanics to play it. The basic lay out in Elder Scrolls Legends is actually really simple once you fully understand it. The main field is set up in two different lanes in a 2×2 grid. You have two lanes and your opponent has two lines. On each side is the player icon with a number on the icon that acts as health. The point of the game is to reduce the player’s health to 0 and win the match. But to do this you have to play cards in one of the two lanes in order to attack your opponent. Each turn you gain 1 point of Magicka which is your card limit for that turn. Each card has a number on them that is a cost you have to pay in order to play them, so if the card is a 3 and you have 4 Magicka then you can play that card and still have 1 Magicka leftover. A huge thing to note about the mechanics of this game is how the attacking system works. If you have cards on the field, after the first turn they are played they can attack. Once you can attack it doesn’t matter what is on your opponent’s side of the field you can still attack their player icon to deal direct damage. If your opponent has a Guard card on the field you have to destroy that first before attacking directly from that lane. Aside from attacking cards, there are item cards which can boost some cards Power or Hit points. Or support cards which can deal damage to your opponent’s card or maybe restore some of your player health. Like any card game, a huge part of Elder Scrolls Legends is building your deck in a balanced way and knowing what kind of play style you wanna have. ESL has a lot of cards so learning how to use the ones you have pay off. A huge thing I can start off saying for getting good at Elder Scrolls Legends is simple. Just because you can attack your opponent directly at any time doesn’t mean you should. The whole point of the game is to reduce your opponents hit points to zero so focusing attacks on them should be a no brainer. However, if you focus all your fire on the opponent you’ll be letting them fill their field up with units that are taking no hits what so ever. If your opponent gets their field set up with a lot of cards, whether they be weak or strong, you’re in for a world of hurt. There is power in numbers and that especially sticks in ESL so be sure to focus your attacks on your opponents hit point and their played cards. You always want to have at least one of your opponents lanes empty if you can. Keep one lane dedicated to dealing direct damage while the other line focuses on taking out opponent cards. If your opponent happens to play a Guard in your direct attack lane then do your best to take it out with out suffering casualties. But if you do happen to lose the cards in your lane you can always hold off until you get a Guard card of your own and use that as your unit’s wall to hide behind. Elder Scrolls Legends is a great card based game and holds up well against other contenders out there on the market. If you’re a fan of the Elder Scrolls series and are looking for a good card game then this one is the perfect one for you.